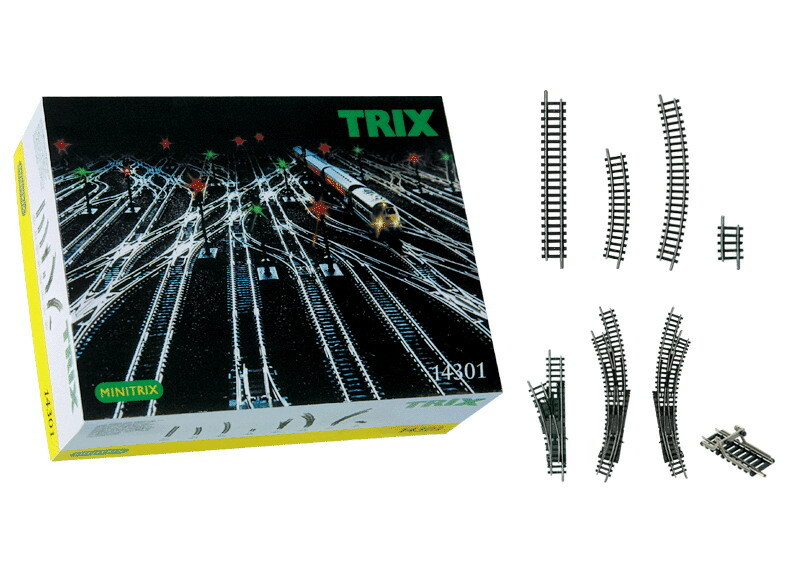 The 14301 track extension set can be used to expand the track pattern for all new starter sets. This set comes with an additional storage siding. It can be expanded easily with the entire Minitrix track program. All of the turnouts can be retrofitted with the 14934/14935 electric mechanisms. Contents: 30 no. 14904 straight track, 104.2 mm / 4-7/64". 4 no. 14914 curved track R 1 - 24°. 6 no. 14922 curved track R 2 - 30°. 2 no. 14926 curved track R 2 - 6°. 1 no. 14951 left turnout R 1 - 24°. 1 no. 14956 left curved turnout. 1 no. 14957 right curved turnout. 1 no. 14991 track bumper 50.0 mm / 1-31/32". Example of how to expand: 11476 with 14301.